Surface science has a wide range of applications that include semiconductor processing, catalysis, vacuum technology, microelectronics, flat-panel displays, compact disks, televisions, computers, environmental monitoring of pollutants, biomaterials, artificial joints, soft tissues, food safety, pharmacy, and many more. 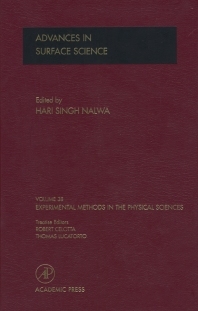 This volume is intended for upper-level undergraduate and graduate students in universities, individual research groups and researchers working on surfaces of materials. It is of interest to chemists, solid-state physists, materials scientists, surface chemists, polymer scientists, electrical engineers, chemical engineers, and everyone involved in materials science. Experimental researchers, graduate students, and industrial practitioners in applied physics (especially in the areas of thin film growth, optical coating, plasma etching, patterning, machining, polishing, fracture, tribology, and related areas).